Green space in urban environments provides social, economic and sustainability benefits. There are now many studies that quantify these benefits to health and wellbeing, biodiversity, carbon sequestration, cost reduction and in added financial value terms. With so many possible benefits on offer, should every project include an early stage assessment of how to maximise green space potential? 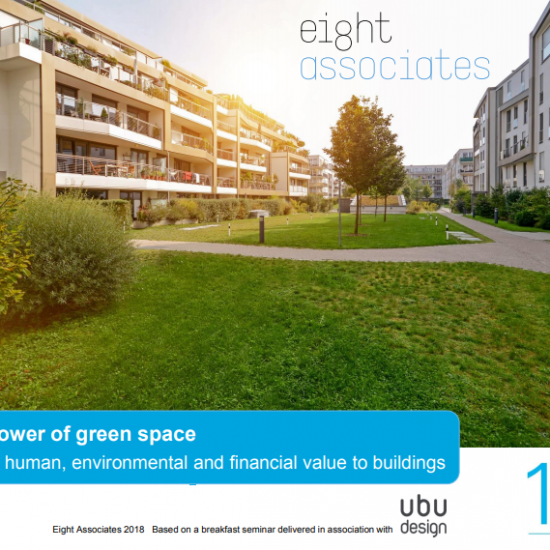 Following our popular ‘The power of green space’ breakfast seminar in association with UBU Design, we’ve produced this ebooklet on the topic, as part of our 10th anniversary celebrations. Eight Associates is sharing its expertise and highlighting a few of the biodiversity elements to consider, to create a well considered design which will ensure wide-ranging benefits with long lasting impact. Please get in touch on 020 7043 0418 or info@eightassociates.co.uk if you’d like to discuss your requirements.